WPI founder John Boynton established the school’s first operational fund in 1865, with the idea the money would only be used for the purchase of apparatus, the establishment of a library collection, or emergencies. Boynton did not anticipate there would be so many “emergencies” during the early days of the Institute, so WPI operated without a formal library for its first two decades. After the construction of Salisbury Labs in 1889, a formal library space was established in Boynton Hall. 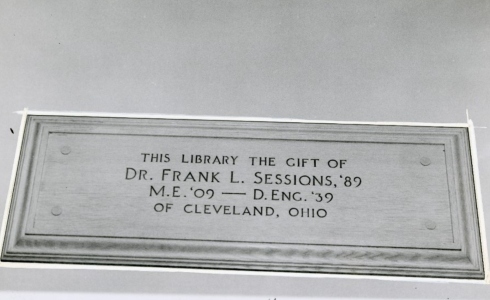 Located near the president’s office, the library room featured more than 15,000 volumes of books donated by faculty and alumni supplemented by a memorial fund established to honor founding president Charles O. Thompson. 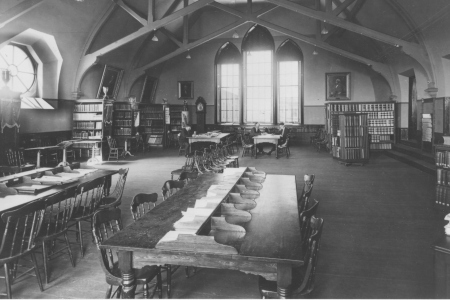 By 1913, the expanding library collection needed more room, therefore the collection was moved to the unused chapel on the third floor of Boynton Hall. In 1925, the newly arrived President Ralph Earle revived the chapel program and called upon the alumni class of 1895 and 1896 to contribute to the chapel renovation fund as penance for their prank of stabling a horse in that space one evening. As a sign of appreciation for their contributions, Earle had the chapel space dedicated in honor of John E. Sinclair, a beloved teacher of the pranksters. Now home to WPI’s performing arts programs, Alden Memorial was once a multi-use building that featured the first dedicated library space designed from a building’s inception. Located on the ground floor, this general library featured its own entrance along West Street. A gift from Dr. Frank L. Session, WPI Class of 1889, enabled the Alden Library to offer previously unavailable technologies, such as a state of the art phonographic records player. 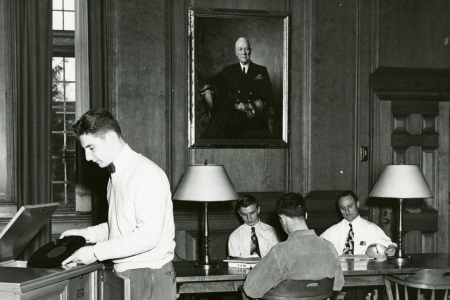 In addition to the library rooms in Boynton Hall and Alden Memorial, sets of books were kept by academic departments for use by students and faculty. There was no uniform standards of service, available hours, or a control system to monitor the books. The issues that arose from a lack of basic library services for the growing student body forced campus administrators to consider the construction of a dedicated library building, though the project was often delayed owing to more pressing needs. By 1963, the issues raised by the students and faculty owing to a lack of a centralized library were too great to ignore. It was then a generous gift that would forever alter the campus landscape. A native of Worcester, Massachusetts, George Crompton Gordon graduated from WPI in 1895, with a degree in mechanical engineering. His career included managing and eventually co-owning many of the most successful manufacturing plants in New England before relocating to Cleveland, Ohio. During World War I, Gordon supervised the preparation of the crankshaft for the first Liberty Aviation Motor and during World War II his crankshafts were used by the US Navy in anti-submarine warfare. A cherished citizen and alumnus, Gordon died on May 27, 1964. 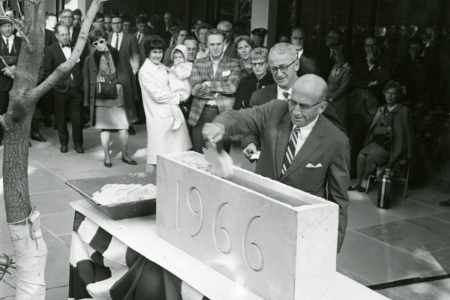 Before his death, his planned gift of $5,000,000 allowed then WPI President Harry Purnell Storke to push forward the crowning achievement of his campus revitalization plan, the construction of a dedicated library. At the time, it was the largest single gift in WPI history. As WPI administrators, along with new librarian Albert G. Anderson, Jr., planned the new library, a site was selected on the hillside facing Boynton Street. Anderson was enthusiastic in sharing plans for a host of modern amenities including carpeted lounges, air conditioning, study areas, typing rooms, and a film center. Storke envisioned a place for the faculty to gather away from their familiar departments in order to interact and share ideas with colleagues from other academic disciplines. In this way, Gordon Library would prove instrumental in supporting the inter-disciplinary nature of the WPI Plan. 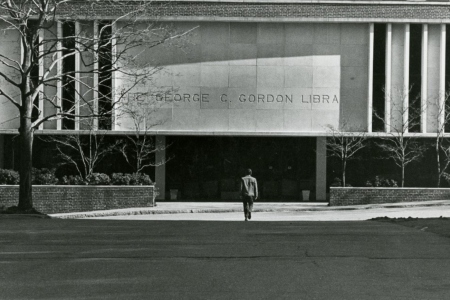 Through the years Gordon Library continued to change and grow in response to the research needs of the WPI community. Typewriters and phonograph players gave way to word processors and tape decks, then eventually computers. 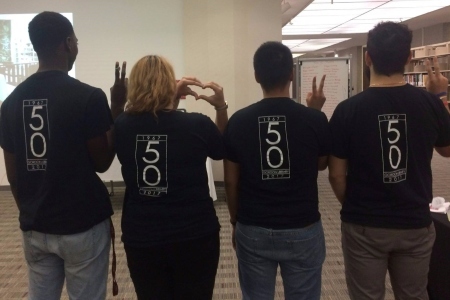 In 2017, Gordon Library celebrated 50 years of service with a yearlong celebration. WPI community members past and present were invited to guest lectures, open houses, and a reception that included a life-sized balloon replica of WPI’s mascot, Gompei the Goat. 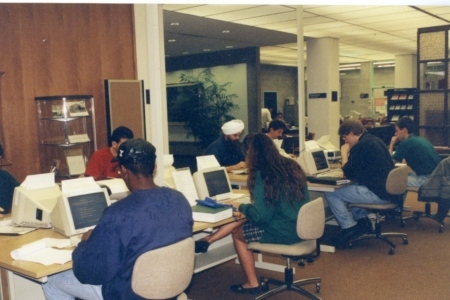 Today as the Gordon Library embarks on the second half of its first century, it continues to serve as a central research hub for the entire campus by ensuring access to the most relevant resources available for every discipline on campus. Librarians partner with teaching faculty to teach information literacy and enable the global dissemination of student and faculty research. 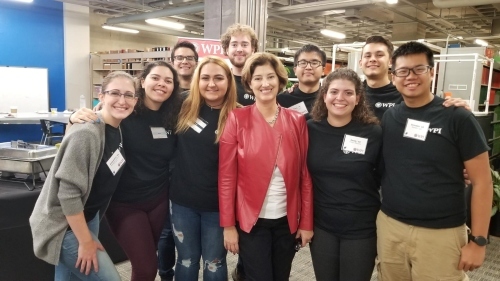 Gordon Library’s databases, digital repositories, and online projects are all instrumental in supporting the WPI mission to "Elevate Impact" as WPI continues to forge new frontiers in STEM education and project-based learning.